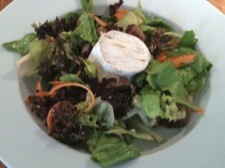 If you like goats cheese then you're going to love this quick and simple salad. Warm goats cheese melts in your mouth and is gorgeous against the crispy sausage. It's perfect for after work if you have friends popping round. 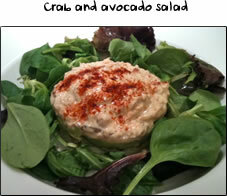 Salads don't have to be boring! A pan/wok to cook the sausages in. Flat fish slice for the goats cheese. Before you start, have your chopped sausages next to the hob. 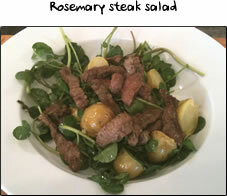 Put the salad in a bowl and have the other ingredients out on your work surface. Put your large pan on a high heat, the grill on high and click here! Turn your grill onto high, then turn your pan on high for the sausages. Put a swirl of oil in the pan and add the chopped sausages. Give them a stir to get them coated with the oil and then turn the heat down to medium whilst you cut the goats cheese. The sausages will take about 6 minutes in total, but don't worry too much as they'll be ready at the same time as the goats cheese. Cut the goats cheese in half horizontally and pop them face down on a piece of tin foil on a baking tray ready to go under the grill. Next take the carrot and peel long slices directly into your bowl of salad and lightly toss together to mix through. Go and check the sausages in the pan. Give them a stir around and hopefully they're starting to get some colour on them. Now pop the goats cheese under the grill for 3 minutes until the goats cheese starts melting out the bottom. Whilst the goats cheese is grilling, keep moving the sausages around the pan getting them nice and crispy. After 3 minutes, turn the heat off the grill and your hob then take your goats cheese out and pop it on your work surface. Take the lemon and squeeze the juice into the pan with the sausages along with about a teaspoon of extra virgin olive oil. Give everything a toss together and take your pan over to the work surface. Empty the sausage and juices into your bowl of salad and lightly toss together with your fingers. If it's too hot for you, use two spoons together to mix. Add a pinch of salt and pepper to the salad and mix. 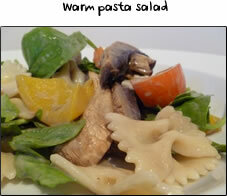 To serve, take your plate or bowl and put a large handful of the salad into the middle. Using your fish slice, carefully take one of the pieces of goats cheese and place it on top in the middle of the salad and you're all done!